The first time I met Dayan at the house of Novi Ritm, I could tell he was a truly kind person. Now, some time after Dayan’s discovery of Novi Ritm, I can just confirm my first impression! I will try to share with you some aspects of this nice young man in this interview, which is the third in the series of interviews with people of Novi Ritm. Dayan is 17 years old and studies to become a designer. Sewing is his future profession. 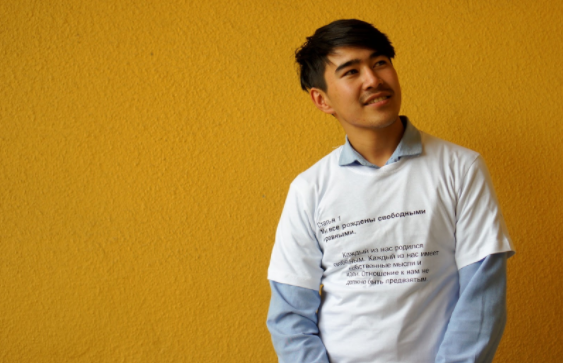 He moved to Osh because of his studies, and originally he is from Alay, more specifically the village Gulcha. Dayan dreams about going to Korea, and he loves Korean music, food and culture. On his free time, he likes to cook and spend time with his family. Also, he is involved in several organizations in Osh. For example, he has participated in some of InStreams activities by playing with children, he visits Youth of Osh and – of course – Novi Ritm. I ask him why he is involved in these organizations and he answers that he wants to gain new knowledge and develop his leadership skills. Well then Novi Ritm is the perfect place! At Novi Ritm, Dayan is a participant of the Environment Group and Movie Club. His interest for the environment group comes from that he wants to make a change when it comes to the environment, since he thinks that a lot of places are dirty nowadays. He has also noticed that with every year, there are less and less birds singing in his village. Dayan is a participant in Movie Club because he wants to practice his English. He thinks that the movies we watch in Movie Club are motivating and teaches him important things that can be useful for his future. During his time at Novi Ritm, Dayan says that he has learnt some new words in English and also general information about the organization itself. That is very important too, since it is important for Novi Ritm that everyone who is involved knows what Novi Ritm stands for and what kind of society Novi Ritm wants to create – because we want to make young people work together towards the common goal of an equal, just and sustainable world. The best thing with Novi Ritm is, according to Dayan… Ainagul! Ainagul is the Chair Person of Novi Ritm, and Dayan looks up to her, saying that she is such an active and kind person. He hopes that he can learn something from her – about leadership and how to run an organization, for example. In Novi Ritm, Dayan sees this opportunity. He wants to practice how to work with different people, no matter if they are old, young, boys or girls! Why are only women on parental leave? Join us on Facebook to stay up to date on our groups and our events!